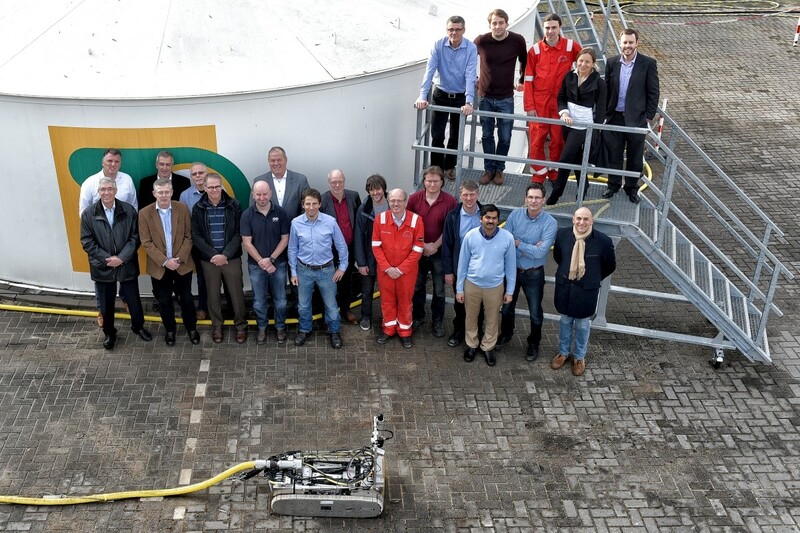 On October 25th, 2016, the PETROBOT Project Closing Seminar took place at the Shell Technology Centre in Amsterdam, The Netherlands. 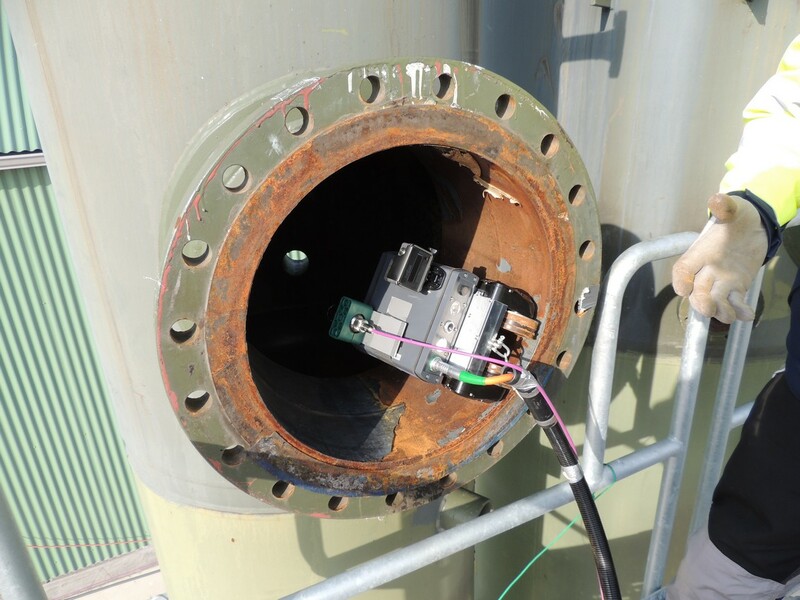 The event hosted approximately 160 people, representing roughly 110 different companies , ranging from oil and gas companies, robotic technology developers, NDT service providers, knowledge centers, academia, regulators, and more. 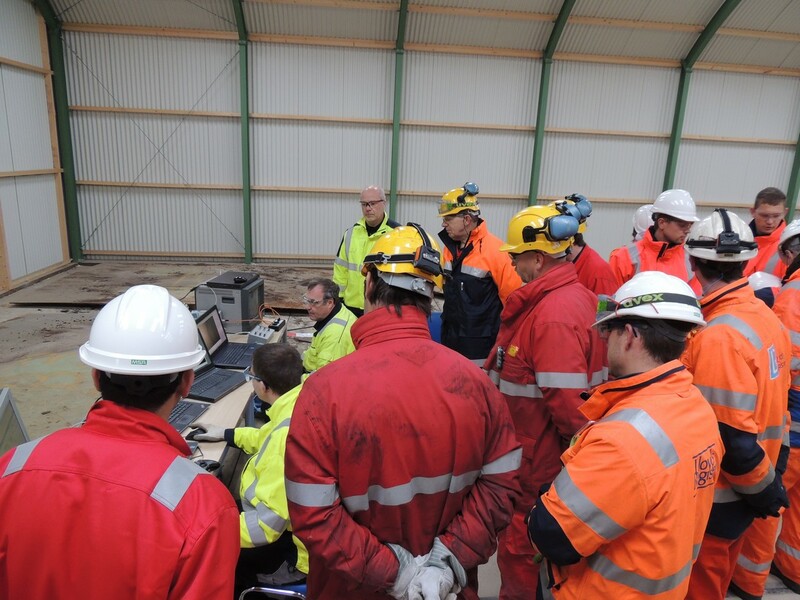 During the week of 29 February, 2016, trials for the Snake-arm robot were hosted by Chevron in Aberdeen. 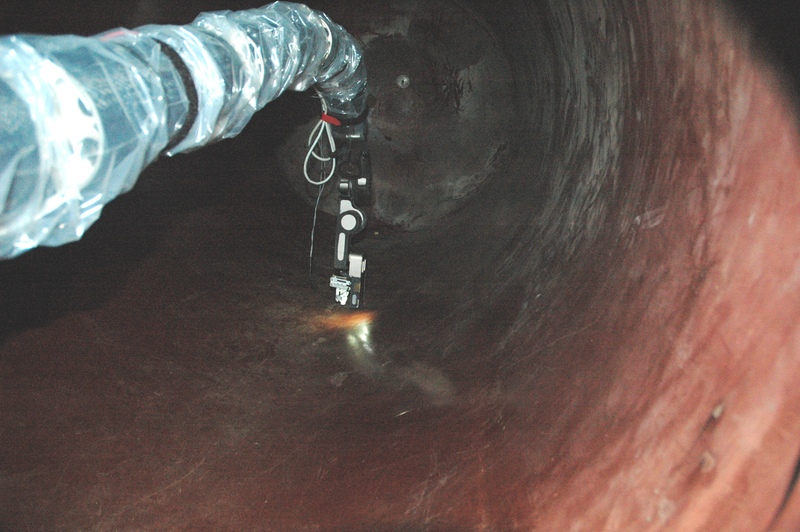 During these trials the HD camera, Structured White Light, UT and Eddy Current tools were tested inside a pressure vessel on a range of manmade defects. Blind trials were carried out (I.E. 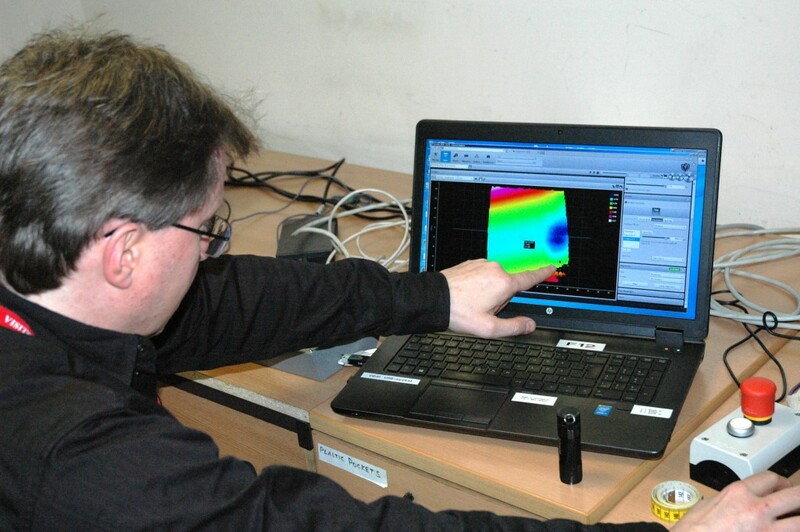 the robot operator and NDE Inspector did not know beforehand where the defects were located) and the vessel defects were successfully mapped out and characterised using the NDT tools available. To the excitement of the team, some natural defects were also detected. 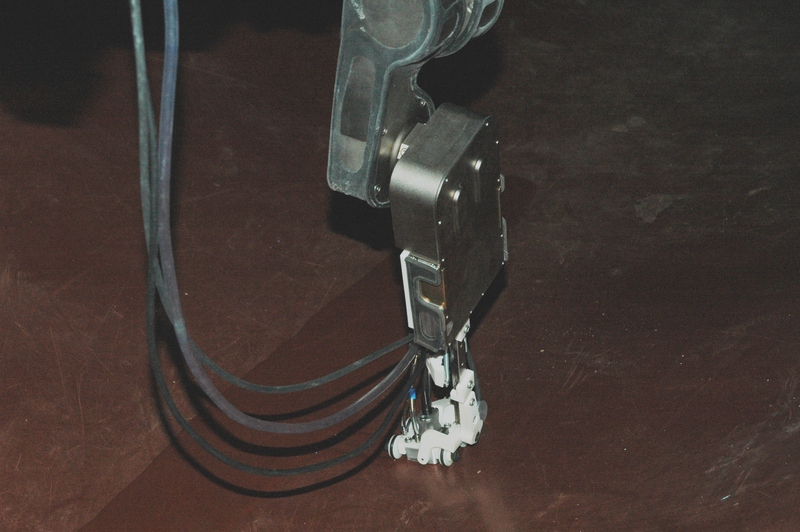 The results obtained will be compared with the ‘human vessel entry’ inspection report to understand the current defect detection capability of the Snake-arm inspection robot. It was a busy week with a lot of vessel inspection time while at the same time also accommodating Chevron visitors, Senior Management and a video crew. All the parties involved are thanked for their contributions during this very successful week. 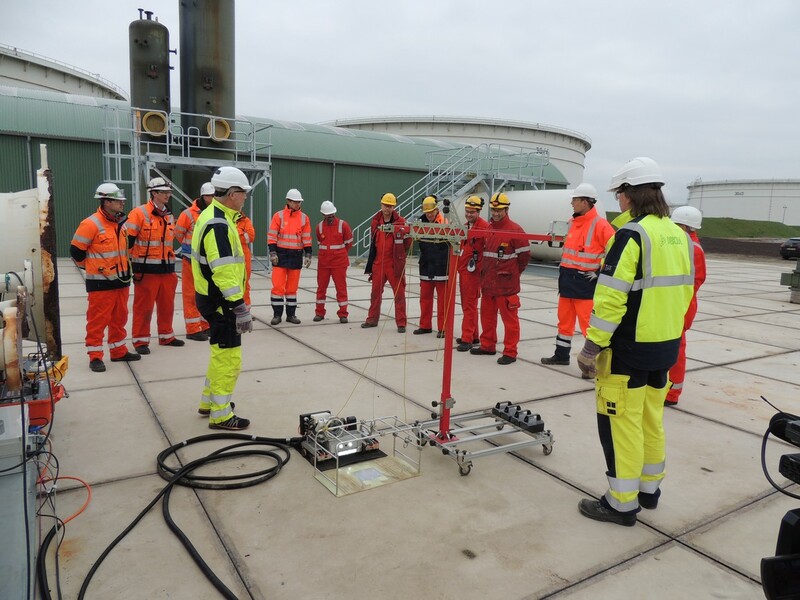 In November and December 2015, the FAST and BIKE platforms, as well as the Snake-arm robot, was tested in 4 different pressure vessels at Shell Europoort. The objective of these trials was to deploy the robots, mounted with NDT tools (camera, profilometer, eddy current and UT), in the pressure vessels and assess the functionality of the robots. 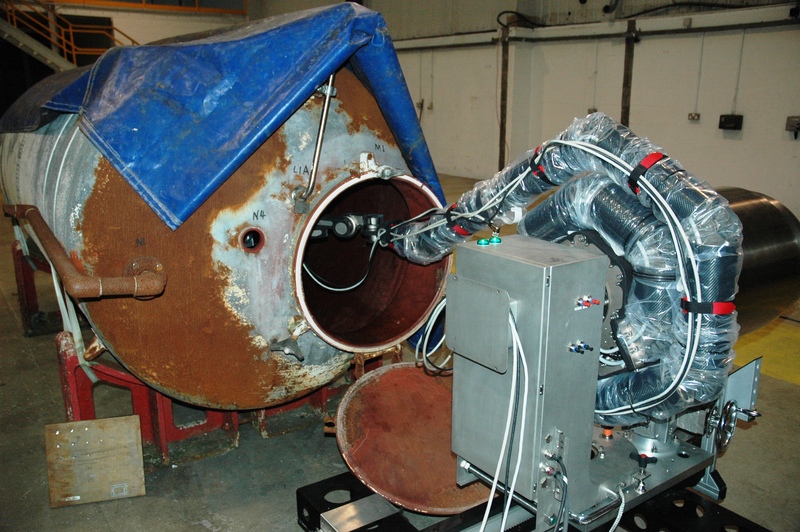 Several aspects related to safe deployment and retrieval of the robots through side and top man-way in horizontal and vertical vessels were tested. All the robots were able to enter in all types of vessels and demonstrated an acceptable level of operational readiness. 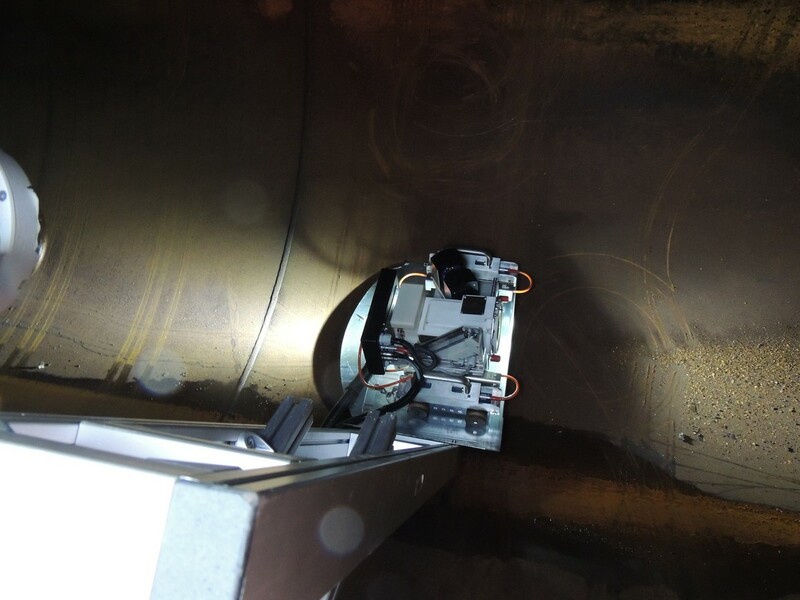 In addition, a real field evaluation of the robots was done at Shell Pernis late 2015 and the inspection results from the robotic inspection are being evaluated. Throughout the process we captured video of the trials and produced a small video to explain what we did. Please enjoy it below. 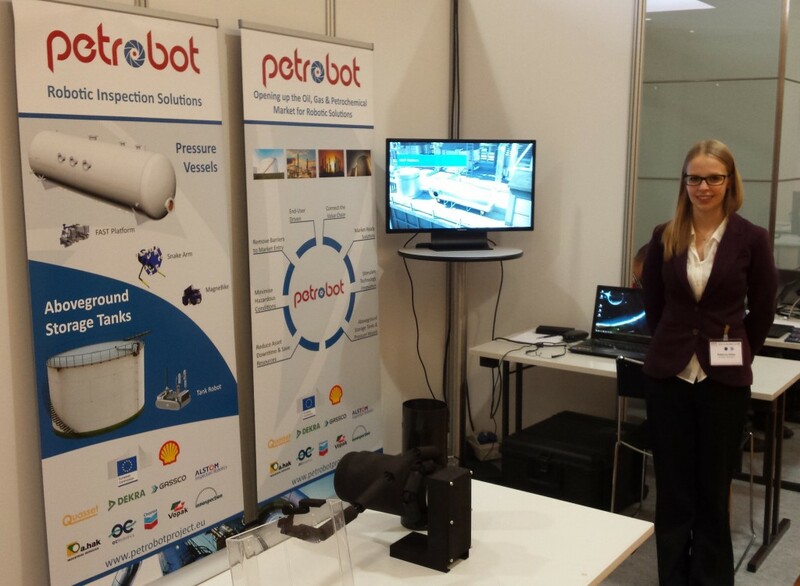 The 2nd year EU Review of the PETROBOT project took place on Thursday, 17 December 2015. 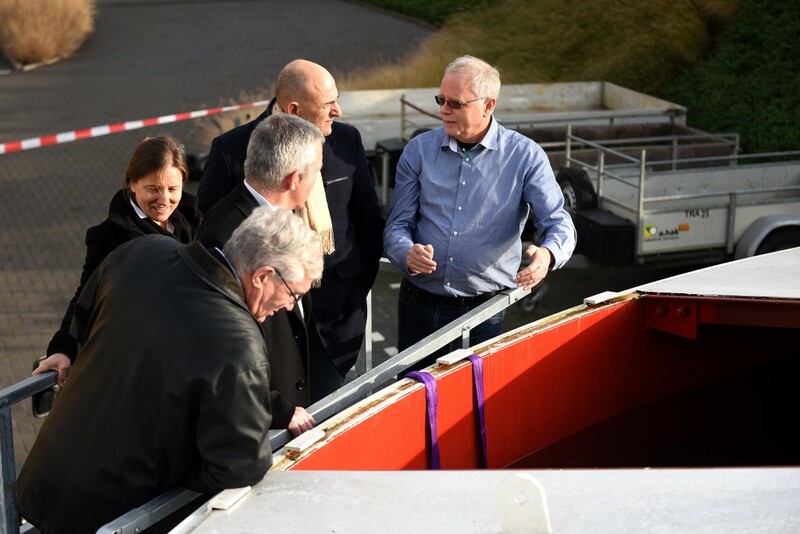 The event was hosted by A.Hak Industrial Services in Tricht, The Netherlands. The project progress was reviewed by a panel of experts from the petrochemical, inspection and robotics industries. 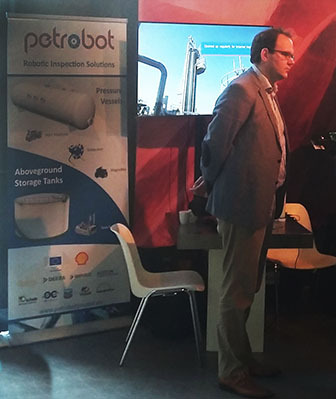 The PETROBOT team presented the work and results achieved during the 2nd year of the project, with each of the work packages giving presentations on the progress made during the year, the status of their deliverables, and also the activities planned for the final year of the project. The project’s scientific advisory board also attended the event. Each of the 4 robotic platforms and the associated inspection equipment that have been developed during the PETROBOT project were demonstrated to the Review Board. 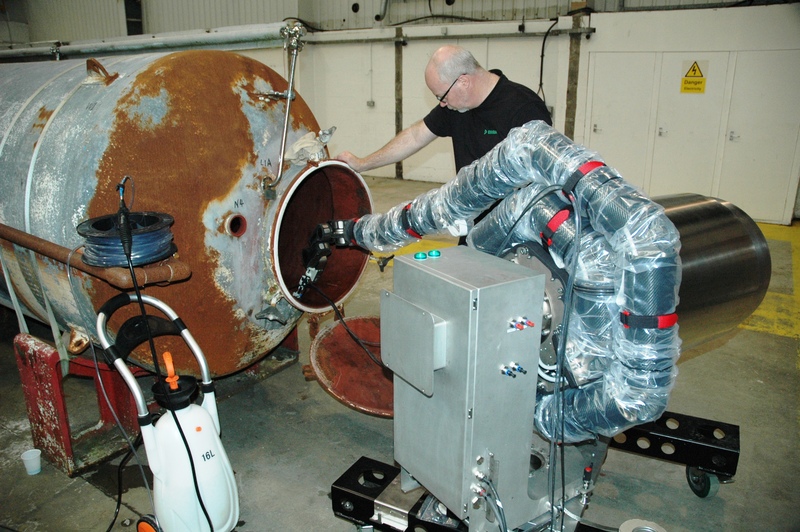 A new video was also presented, demonstrating the field testing of the pressure vessel inspection robots, that took place in Q4, 2015.This new video will be available on our website soon. The feedback received was very positive, with the Review Board members sharing their appreciation for the progress and commitment of the PETROBOT partners. The demonstrations were well received, creating enthusiasm and excitement concerning the impact of PETROBOT on the future of inspection and maintenance robotics. The PETROBOT project is now in its final year. There will be some exciting events coming up, such as the project symposium and demonstrations of the PETROBOT robots, which will be announced on our website and social media channels. 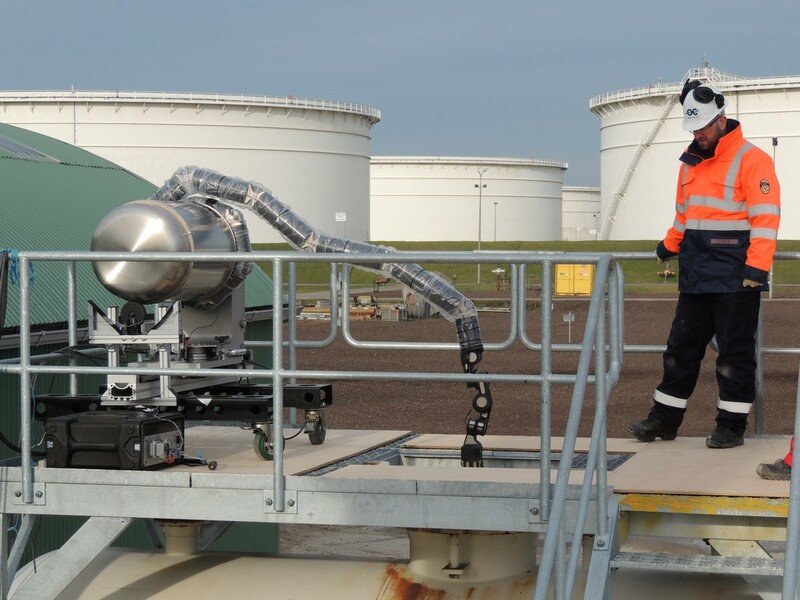 We believe that 2016 will be a significant year in shaping the future of robotic inspection solutions in the oil and gas industry, and we are truly excited to be part of it! PETROBOT was represented at the NAP 55 years jubilee convention on 12 November 2015 at the ‘Veerensmederij’ in Amersfoort, The Netherlands. NAP is a Process Industry Competence Network aimed at assisting companies active in process industry with formulating and improving policies. The convention hosted many exhibitors and speakers were focused around the impact of breakthrough technologies on the process industry value chain. 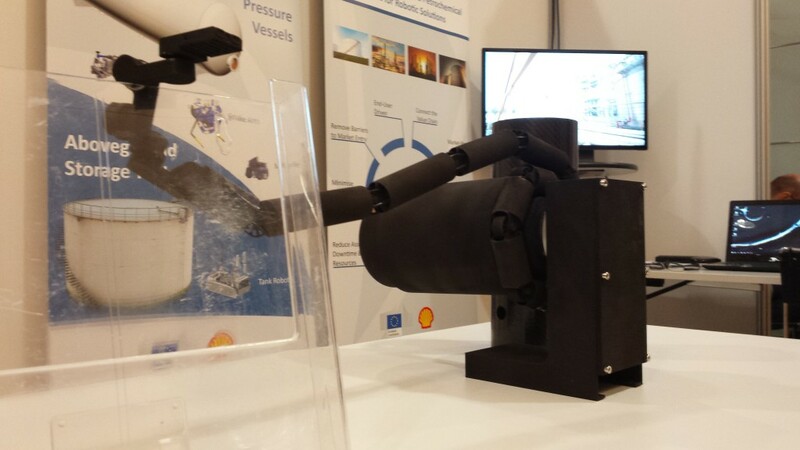 Shell representatives attended the conference and displayed a model of the PETROBOT Snake-arm, which was received as very interesting and certainly considered a breakthrough technology that may have a large impact on the process industry. 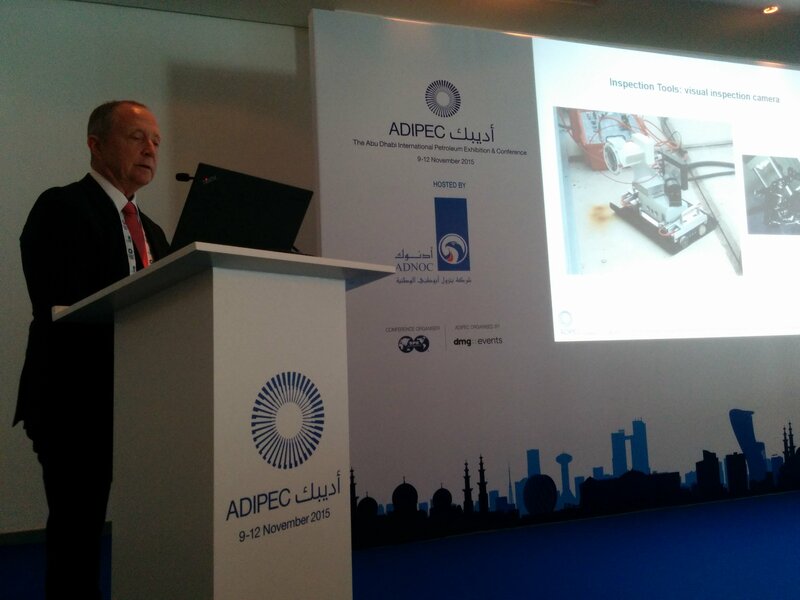 Members of the PETROBOT consortium attended and presented a paper at the 2015 Abu Dhabi International Petroleum Exhibition and Conference (ADIPEC). 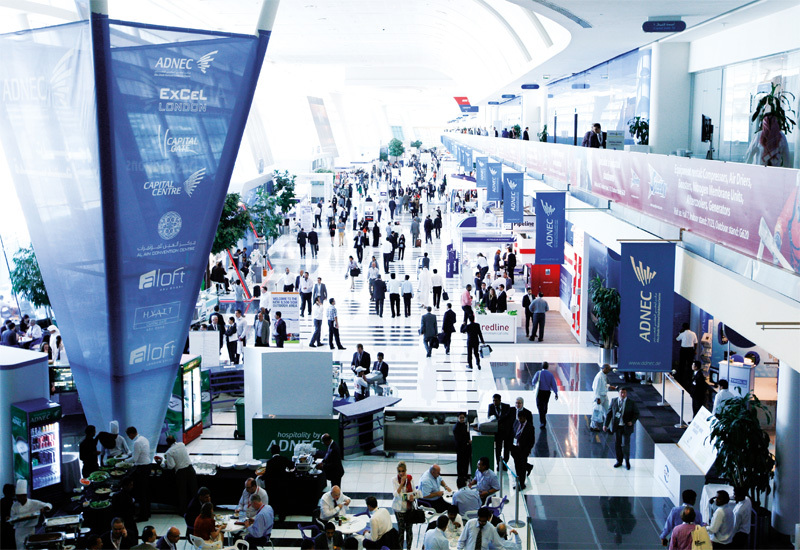 The event took place in Abu Dhabi, UAE, from 9 to 12 November 2015. 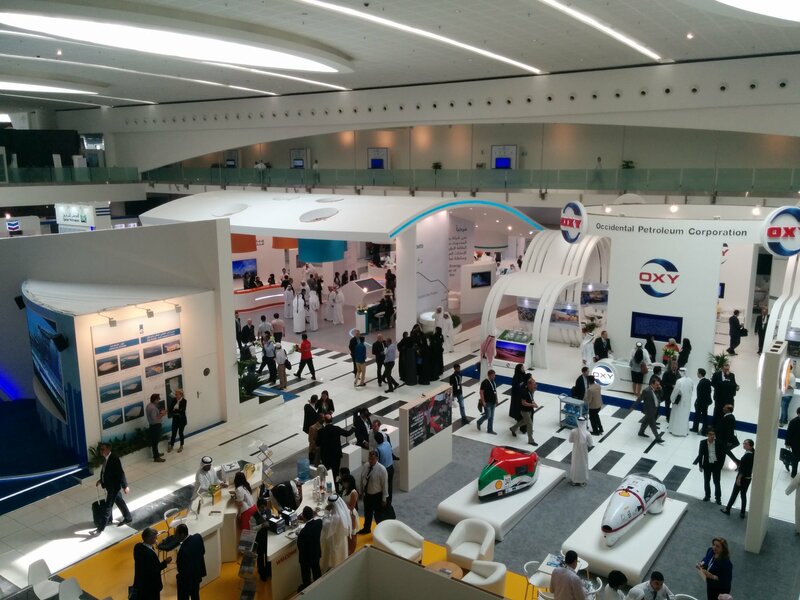 One of the largest Oil & Gas exhibition and conferences in the world, ADIPEC was visited by over 85,000 visitors, who had the opportunity to view over 2000 exhibitors and attend over 100 technical sessions of the current and future developments within the industry. Under the appropriate theme of Innovation and Sustainability in a New Energy World, the technical and executive program focused on ways to maximise efficiency and save costs in the current economic climate. The paper presented by Dekra and OC Robotics summarised the PETROBOT project objectives and activities carried out to date, including the successful trials of the FAST and BIKE platforms that took place at Europoort, The Netherlands, in October 2015. 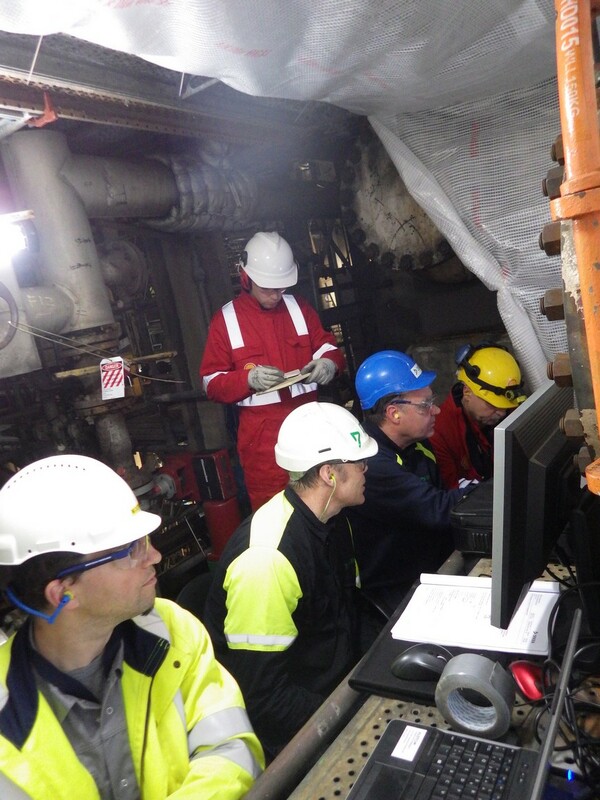 Delivered in the ‘Operational Excellence: Integrity inspection’ technical session, the paper received positive feedback for the aims of improving human safety and reducing asset downtime. 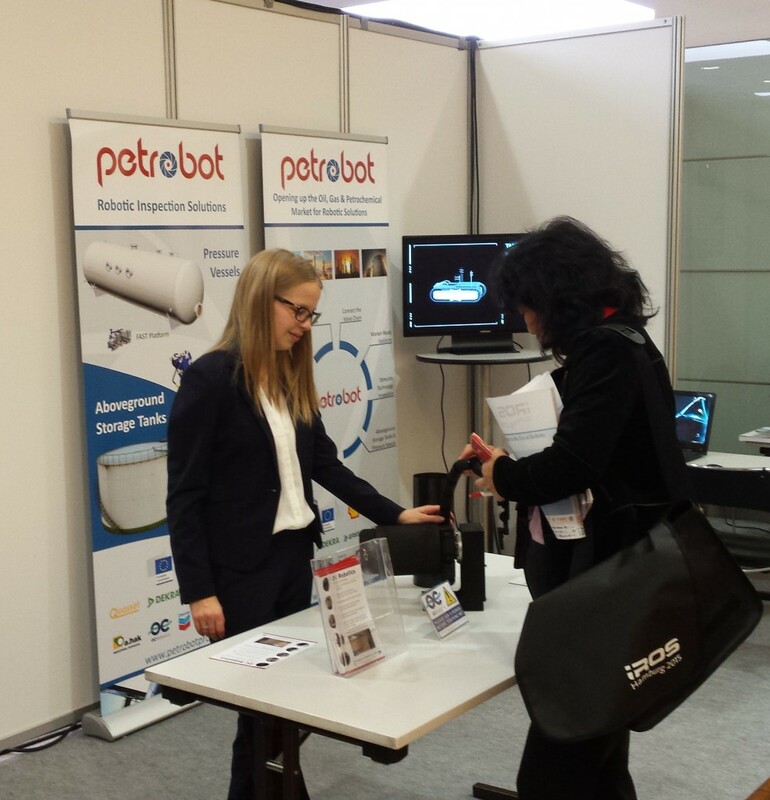 The 2015 IEEE/RSJ International Conference on Intelligent Robots and Systems (IROS) was attended by members of the PETROBOT project, where we also hosted a booth. The event took place in Hamburg, Germany, from September 28 to October 02, 2015. 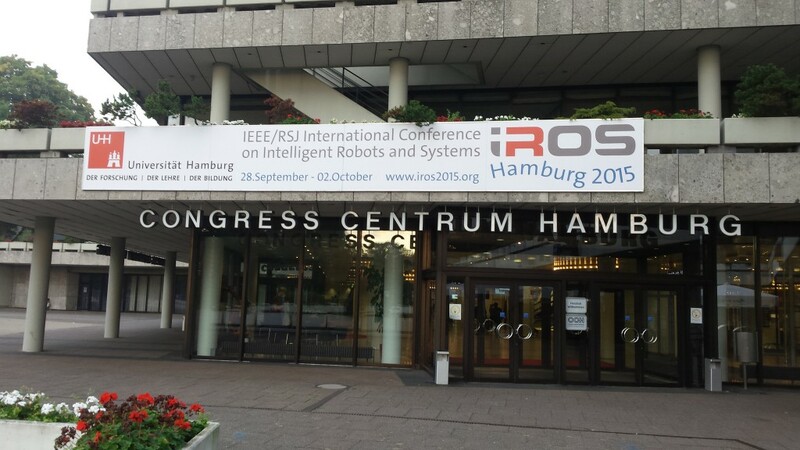 IROS is a top international conference in the area of intelligent robotics. The event was attended by approximately 2500 people from around the world, where researchers discussed the cutting edge in robotics. Through the industrial exhibition as well as live demonstrations, students, developers and entrepreneurs seeking the latest developments and applications in robotics could meet and network. Exhibitors included not only industrial robotic manufacturers and other industry related parties from all parts of the world, but also more than 50 European funded projects exhibited at the conference. This allowed PETROBOT to give high visibility to the EU Robotics Program and gave the project consortium the opportunity to demonstrate its achievements in a tangible way. The booth was manned by members from Quasset and OC Robotics for the entire duration of the conference, including the Citizens Forum, where we gave visitors an overview of the project. Together with the PETROBOT banners and videos, a ¼ scale model of OC Robotics’ snake-arm robot was also on display to help visitors visualise and understand some of the technology which has been developed. 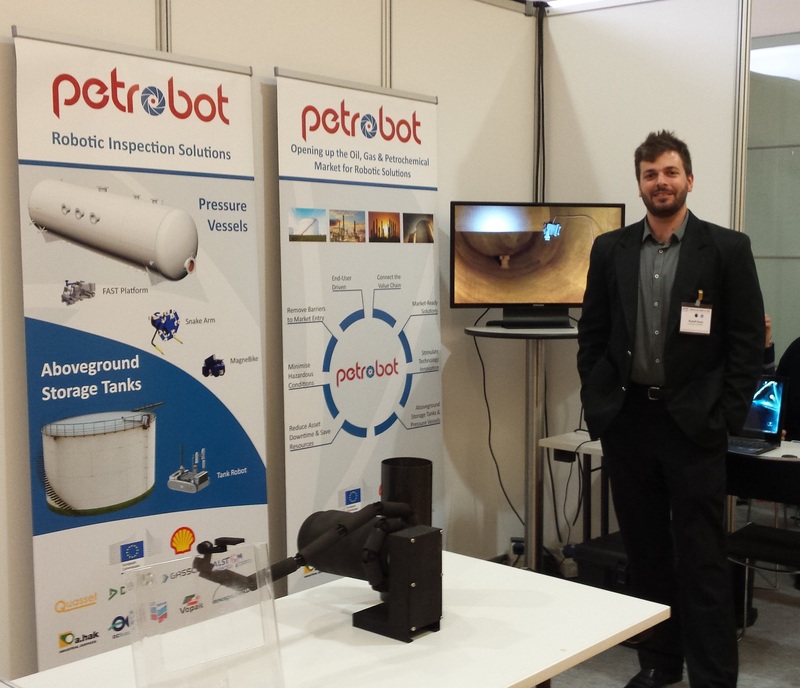 The feedback from visitors and guests was very encouraging as they showed lots of interest in the PETROBOT project and acknowledged and shared our enthusiasm for the meaningful and practical objectives of the project. The PETROBOT project celebrates its second birthday today. The past year has seen the project advancing from the specification and design phase to the development phase. 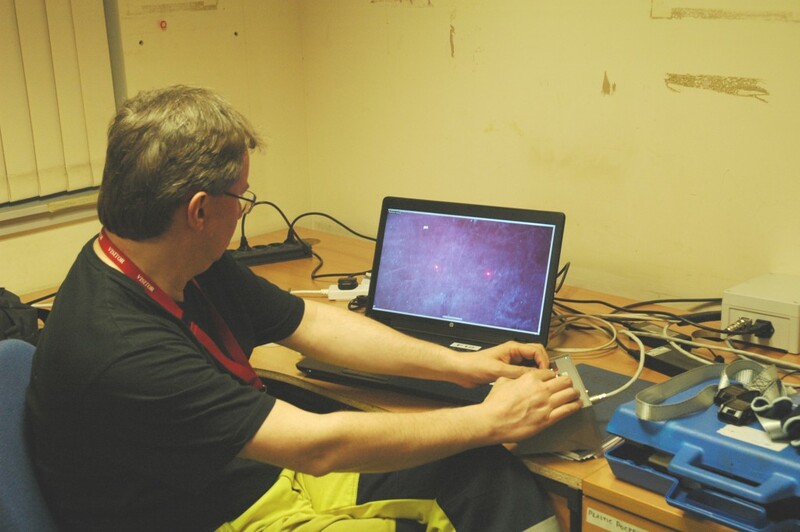 The project is now in its final year and the robotic inspection solutions are ready for field testing and trials. We would like to thank all the consortium partners as well as any other parties that have contributed in any way, ensuring the successful progress of the project. We are all looking forward to an exciting final 12 months!